We’d love your help. Let us know what’s wrong with this preview of Until Sweet Death Arrives by Amnon Binyamini. Nahum Patterson, happily married to Edna, is a talented journalist who investigates and then exposes corruption cases in the newspaper. His professionalism is well appreciated, except by those whose reputation he has destroyed. One man, hurt by Nahum’s story, had to flee the country; another was sentenced to prison and became vengefully bitter. Although he knows he is in a dangerous profession, Nahum is on top of the world. His memory slowly and tragically slips away, but his enemies remember him! Binyamini leads the reader into an intriguing thriller, from the first page to the last. But in addition to being a fascinating read, this book teaches us about the anguish of Alzheimer's disease and how to deal with it. We feel pain and compassion, yet are fascinated by the drama and amazed by the unexpected ending. To ask other readers questions about Until Sweet Death Arrives, please sign up. Whatever flaws we might identify or frustrations we might feel are trivial in comparison to a reader's pure joy in losing himself/herself in a narrative. When all the elements come together: an intriguing plot, thoughtful, profound themes, complex, troubling, characters, and language that make us shudder for its honesty, clarity, and confidence; we gratefully set all analysis aside and give ourselves up to the sheer magic of a great book. And for me, Until Sweet Death Arrives, is such a book. Aut Whatever flaws we might identify or frustrations we might feel are trivial in comparison to a reader's pure joy in losing himself/herself in a narrative. When all the elements come together: an intriguing plot, thoughtful, profound themes, complex, troubling, characters, and language that make us shudder for its honesty, clarity, and confidence; we gratefully set all analysis aside and give ourselves up to the sheer magic of a great book. And for me, Until Sweet Death Arrives, is such a book. Author, Amnon Binyamini, weaves a fascinating yet sensitive tale which includes the subject of Alzheimer's. With its intriguing twists and turns it will easily captivate the reader's attention from the beginning. The story had every element a good story should have. An exciting plot, attention to detail, but best of all fleshed out, well-written and well-rounded character development. There’s an abundance of well illustrated scenes that make you feel like you are right there in the story, and that's something I really look for in a good book. The book description says it all; 'Nahum Patterson, happily married to Edna, is a talented journalist who investigates and then exposes corruption cases in the newspaper. His professionalism is well appreciated, except by those whose reputation he has destroyed. One man, hurt by Nahum’s story, had to flee the country; another was sentenced to prison and became vengefully bitter. Although he knows he is in a dangerous profession, Nahum is on top of the world. Now, if that’s not enough to whet your appetite, I don’t know what will. But if you want to find out what happens, you’ll just have to turn the pages for yourself to find out! This captivating and commendable work had me immersed from the beginning. The story flowed from scene to scene with ease, and the author shows exceptional ability when it comes to storytelling. There are plenty of attention-grabbing moments in this page turner that will take the reader on an fascinating journey! It’s one of those books that come along once in awhile that makes you want to read it non-stop until you get to the end. I’m giving nothing further away here. And this, I hope, will only add to the mystery and enjoyment for the reader. Who will call death sweet? Until Sweet Death Arrives by Amnon Binyamini is an intriguing thriller. The lead character Nahum Patterson of this out of box storyline makes you believe that death can be sweet for some. While the high-end drama talks about corruption it touches a very sensitive area of human life. It also talks about Alzheimer's disease and the agonies and anguish it brings in one's life. In fact, it not only impacts an individual who suffers from it but the whole spectrum of family and friends. Nahum and Edna is a happily living and loving couple. He is a journalist having an edge over his peers with an extraordinary talent in investigations and research of his cases. With the help of this talent, he could expose a number of corruption cases in the newspaper. In fact, when it comes to fighting against corruption Nahum would not mind putting his life at risk. That makes the story of Until Sweet Death Arrives by Amnon Binyamini quite interesting and intriguing. But there is a lot more to it. While he is a soar in the eyes of the world of corruption, his professionalism and expertise is a point of appreciation in the professional world. He has been responsible for putting many corrupt person's reputations at stake because of stunning revelations. All in all, Nahum is living with a high amount of risk to his life all the time. But he barely cares for it. For him, his profession and talent are prime to fight against corruption in the world. But destiny has something different in store for him. All of a sudden his world of talent starts fading with abruptions. An engrossing read, ‘Until Sweet Death Arrives’ should be on everyone’s TBR. Realistic and touching to the core, the book takes us on a journey of life, one that none should fall prey to, an agonizing one. It is a grim reminder that Alzheimer’s can knock on anyone’s door at any time and that it does not strangle only the victim but the entire family with its vicious grip. The book is a thriller no doubt and though I am a fan of thrillers, I found that I was more engrossed in Nahum’s state post h An engrossing read, ‘Until Sweet Death Arrives’ should be on everyone’s TBR. Realistic and touching to the core, the book takes us on a journey of life, one that none should fall prey to, an agonizing one. It is a grim reminder that Alzheimer’s can knock on anyone’s door at any time and that it does not strangle only the victim but the entire family with its vicious grip. The book is a thriller no doubt and though I am a fan of thrillers, I found that I was more engrossed in Nahum’s state post his being diagnosed as being stricken by Alzheimer’s, and the way Edna as well as those around him try to come to terms with the fact and take care of him. The language is simple, crisp and lucid and flows unhindered. The play of words is perfect and helps project the situation in real-time to the readers. The pace is perfect, steady and smooth and the characters are well- articulated and one can easily relate to them. While it’s natural to feel sad for Nahum and family, one can’t but appreciate Michael’s role in taking care of the sick man. There are some interesting twists and turns and a surprising climax with regard to a shady character in Nahum’s life. A must read, ‘Until Sweet Death Arrives’ will transport you to another world, the world of Alzheimer’s. In fact it will help you get a better understanding of the disease and make you empathize with the victims and their caregivers. In Until Sweet Death Arrives, main character Nahum Patterson is a talented journalist whose professionalism is well regarded by just about anyone… Except the people whose reputation he has destroyed. While Nahum reckons the dangers of his profession, he doesn’t actually believe anything will happen to him, or any of the people he’s helped bring down will take revenge on him. The book handles the theme of mental illness well, and does so in a respectful yet tragic way, showing how horrible it truly is, and how it weakens people, cripples them. In this case, Nahum struggles with Alzheimer’s disease, and it destroys his memories one by one. It’s horrible to read, and saddening too considering he’s still in the prime of his life. Nahum Patterson is an accomplished investigative journalist for a Tel Aviv newspaper, who puts his life on the line to do stories exposing official corruption. His stories resulted in one man having to flee the country, and put another in prison—both have sworn to get revenge. In the meantime, Nahum’s memory slowly begins to fade as Alzheimer’s disease takes hold of his mind. Until Sweet Death Arrives by Amnon Binyamini is a crime thriller, but mainly it’s a profoundly disturbing tale of the havo Nahum Patterson is an accomplished investigative journalist for a Tel Aviv newspaper, who puts his life on the line to do stories exposing official corruption. His stories resulted in one man having to flee the country, and put another in prison—both have sworn to get revenge. In the meantime, Nahum’s memory slowly begins to fade as Alzheimer’s disease takes hold of his mind. 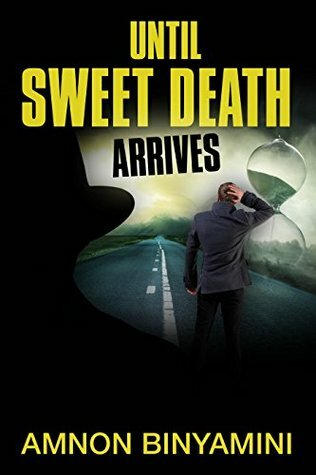 Until Sweet Death Arrives by Amnon Binyamini is a crime thriller, but mainly it’s a profoundly disturbing tale of the havoc diseases like Alzheimer’s wreaks on individuals and families. It follows the deterioration of Nahum from the onset of the disease, when he begins to find himself in places with no knowledge of how or why he came to be there, through the final stages, when he has to be confined for his own safety, and has no real awareness of his surroundings. The author does an amazing job of portraying this condition, not to gain sympathy, but to generate understanding of the effect it has on the sufferers and everyone around them. Nahum Patterson, happily married to Edna, is a talented journalist. He is not afraid to take on powerful people and exposes the wrong doings. He is highly regarded in the professional circles. But his life becomes pathetic due to his disease. He starts forgetting things but his enemies do Mental illness is much more devastating than physical illness. The reason is simple. Brain controls the whole body and if brain goes kaput. Whole body stops functioning. Alzheimer’s disease is especially cruel.